The Smartgrow Indoor Garden utilizes the principles of aquaponics which is a food production method. However, in our system fish nourish the mind and spirit instead of the belly. Using the principles of aquaponics, it is possible to grow almost any freshwater fish, freshwater crayfish or shellfish as long as they thrive in similar temperatures as the bacteria and plants. 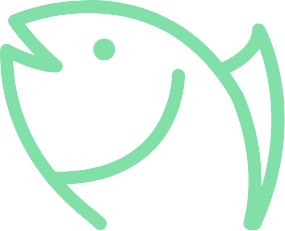 We believe it is unethical to grow large fish in a small aquarium. That’s why we utilize decorative aquarium fish for our ecosystem. They can’t be grown for food but the joy of watching, feeding and nurturing them is a rewarding and interesting experience in its own right. These decorative fish still produce rich nutrients that the plants need. Since the plants use those nutrients, the water doesn’t become uninhabitable and maintenance of the aquarium is much easier. 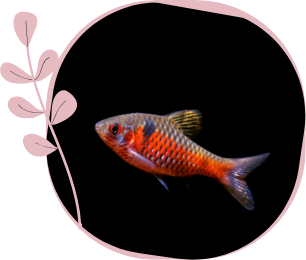 Odessa barb is from Myanmar where it can be found in the Chindwin river. Odessa barb is an elegant, fast and peaceful schooling fish. The male is more colorful than the female with bright red on the side. Odessa barb can grow up to 6 cm long and can live for as long as 10 years. This colorful, playful and lively schooling fish comes from South-East Asia, specifically from Sumatra and Borneo. 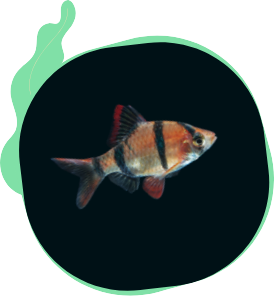 Tiger barbs are omnivorous and greedy fish that can eat themselves fat if given the opportunity. Tiger barbs are notorious for nipping the fins of other fish, but this can be reduced by keeping their schools big enough. Tiger barbs can live up to ten years and grow 8 cm long. Neon tetra is probably the most popular aquarium fish in the world. This small, peaceful and vibrant schooling fish is a native of the Amazon river in South-America. It is an omnivorous fish that mainly eats small insects in the wild. 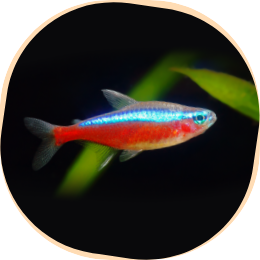 Neon tetra can grow up to 4 cm long and live for 8 years.